Artist Jenny Kendler’s bio says she is “an interdisciplinary ecological artist, environmental activist, naturalist & wild forager”. I would add extraordinarily prolific and innovative to that list of descriptors. Diving into Ms. Kendler’s work is a not only a transformative art experience; it is an awakening to what is possible in the exploration of nature and culture. 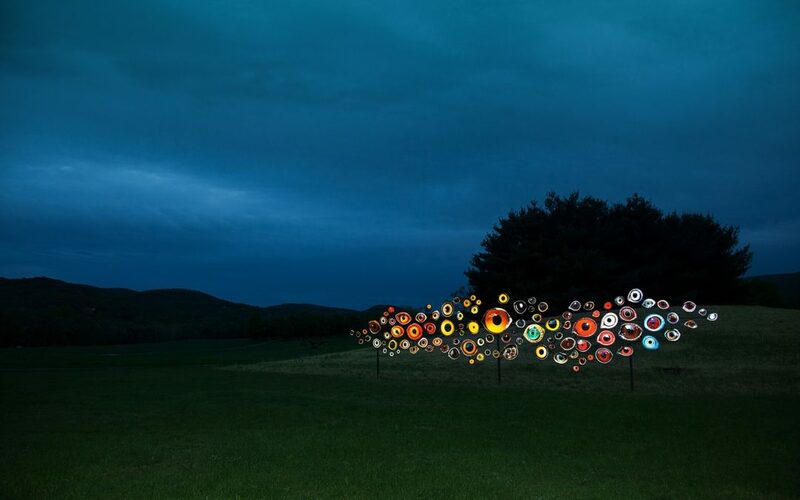 I found her work through the Storm King Indicators: Artists on Climate Change exhibit (2018) where she is exhibiting Birds Watching and Underground Library, both striking art works. Birds Watching is visually arresting, while Underground Library is thought provoking, and together they tell a story of climate change: the extinctions we humans are causing and the carbon cycle we are disrupting. Ms. Kendler has examined climate change previously in her work with Garden for a Changing Climate, Deep Time Chicago, and Solastalgia. It is worth spending significant time on her web site exploring the many projects she’s created and participated in. Her range of artistic capabilities is simply mind blowing and her perspective on the world is a feast for the mind, eyes, and heart.